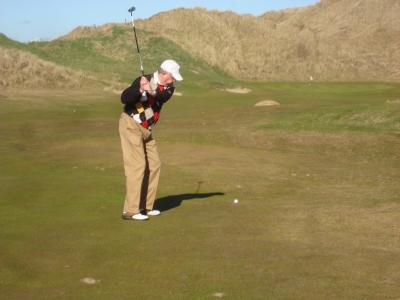 East Lansing’s Jim Trebilcock has visited both sides of the Atlantic to challenge seaside courses Harbour Town and, pictured, Lahinch, in Ireland. Have you ever felt like you needed a vacation after your vacation? Believe it or not, PGA Tour golfers do – especially after the pressure-packed week they “enjoy” playing the Masters Tournament in Georgia. While most of us will never be able to play golf at the super-exclusive Augusta National Golf Club, we can all, including East Lansing’s Jim Trebilcock, vacation where the Tour players decompress following this week’s Masters: The Sea Pines Resort and the Inn at Harbour Town on Hilton Head Island. “I always try to imagine what it’s like to be walking down fairways jammed with fans,” says Trebilcock, who recently had his chance to visualize it at Sea Pines. To wind down with some kinder, gentler, southern hospitality the PGA TOUR players – and often their families – will amble down the road from Augusta next week to the low country of South Carolina for the next Tour stop – the Heritage Classic – on the Pete Dye-designed Harbour Town Golf Links. Even the casual golf fan recognizes the track’s iconic 18th hole with its’ looming red and white striped lighthouse behind the green along the Calibogue Sound. You needn’t be a pro to play at Harbour Town or either of The Sea Pines Resort’s other two courses: Heron Point by Pete Dye and The Ocean Course by former Tour player Mark McCumber. In fact, you needn’t even play golf to enjoy Sea Pines. There are plenty of other activities ranging from tennis to boating, 14 miles of biking and trail walking, bird watching, shopping, horseback riding, swimming, kayaking, wave runners, volleyball, fishing, guided eco-adventures and a 605-acre forest preserve to compliment five miles of Atlantic seascapes. “Harbour Town is filled with stylish shops, eclectic restaurants, and a marina full of multi-million dollar yachts,” says Trebilcock, who has played other famed courses including the courses at Reynolds Plantation near Augusta, Pebble Beach, TPC Sawgrass, and, in Ireland, Lahinch and Doonbeg Golf Clubs. Michael Patrick Shiels may be contacted at InviteYourself@aol.com or via TravelTattler.com His talk show can be heard weekday mornings in Lansing on 92.1 FM and Fox 47 TV.